During December 2015 Christmas Dinners were provided in Limestone House at £6.50 each, for the Creswell Walking Group who meet up every Monday in Limestone House before their walk, also for the Genealogy Club who research their family trees in Limestone House every Thursday morning. Two Course Lunches for your Group, or for your group of friends, can be ordered by contacting Limestone House on 01909 724061. A minimum of one week’s notice will be required before the date the Lunch is required for your group. On Saturday 12th December 2015, when Limestone House had closed, a Christmas Buffet was provided for Trustees, Staff and Volunteers as a big thank you for all their efforts and their work for the Community during 2015. Christmas Music was provided by Trustee Geoff Mallyon. 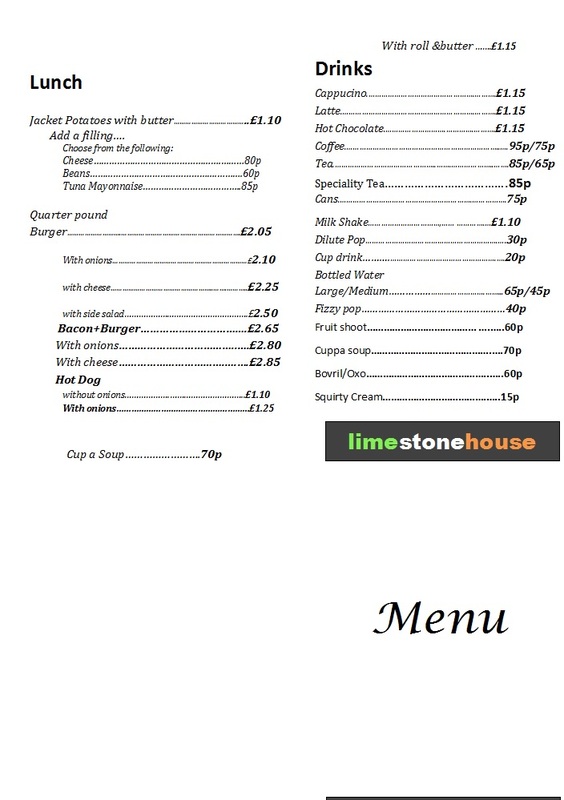 If it’s just a cup of tea or a coffee you crave, you are welcome at Limestone House. If you are a little more peckish, then do have a look at our breakfast and lunch menus. We can also cater for groups using our facilities.